Today's Back-to-School Fiesta! giveaway is perfect for strengthening your child's science skills. 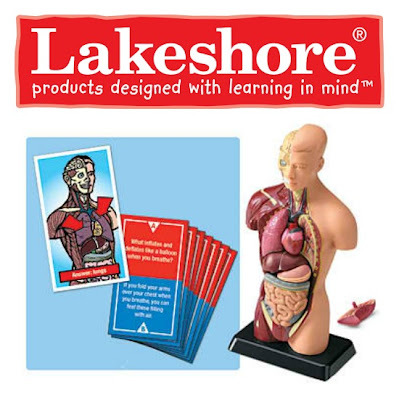 The Fascinating Facts Human Body Game by Lakeshore Learning is a fun way to help your kid learn anatomy. Which organ sends messages to your body at speeds of up to 180 miles per hour? Kids find out with this captivating game! It has over 60 fun questions for kids to explore, plus a 10 1/2" anatomical torso with body parts kids can remove. This game is geared for students in third and fourth grade, but older and younger children can certainly benefit from playing, too. This game is available with playing cards in English only. Lakeshore Learning is offering one of these sets to a MommyMaestra reader. Enter to win below using the Rafflecopter. Disclosure: This is not a compensated post. The company agreed to offer one of these games to a MommyMaestra reader after I contacted them. This would be awesome for my third grader! My son could use this right away and my daughter and younger son down the line - I always notice this game when I'm on Lakeshore's website - it just grabs your attention! I would love, love, love to get this for my daughters!! This would be an awesome game to teach my children about the human body while having lots of fun! THIS WOULD BE GRAT FOR BOTH OF MY KIDS!